Summer Berries and Cream means mouthwatering berry de-light! I really love blueberries. We just recently planted a few blueberry bushes that are starting to produce. They take many years to really get to a nice size (about 5 ft tall) where they produce thousands of berries. Until then, we will continue to get excited over each ripe berry that we eat immediately. My strawberries are also doing well. Growing up I never knew that strawberries are a perennial type of plant, putting down roots and regrowing. If we can get the bunnies to leave them alone long enough, we’ll have another good year for strawberries. 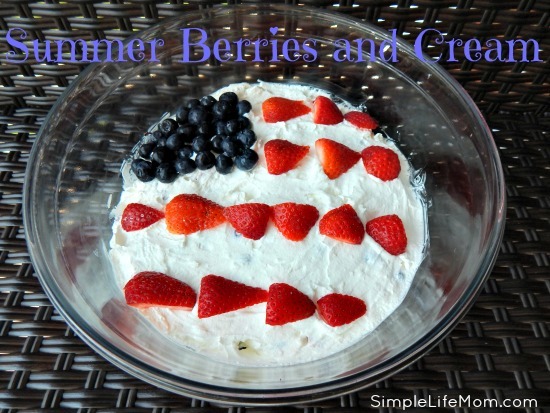 Summer Berries and Cream is a popular recipe to make around Independence Day, Memorial Day, or Labor Day picnics because of it’s red white and blue colors, but it is just beautiful whether it’s relates to those celebrations or not. 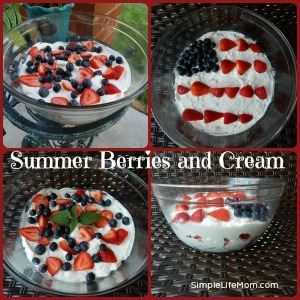 The light cream cheese flavor within the cream combined with the berries just screams summer to me. You can also make this with lots of variety. If you don’t care for cream cheese, only add 8oz instead of 16oz, or don’t add any at all and just make it literally berries and cream. You can also add different fruits like fresh sliced peaches. Place the cream cheese in a large bowl and use a mixer to whip. Make sure it is softened or you will end up with clumps. In a separate bowl, use a hand mixer to whip the cream, slowly adding sugar. Whip until soft peaks form. Gently fold whipped cream into cream cheese. Layer in a glass bowl: whipped cream, strawberries and blueberries, and repeat. If you're short on time, you can use store bought whipped cream and omit the ½ cup sugar. Just watch the ingredients. 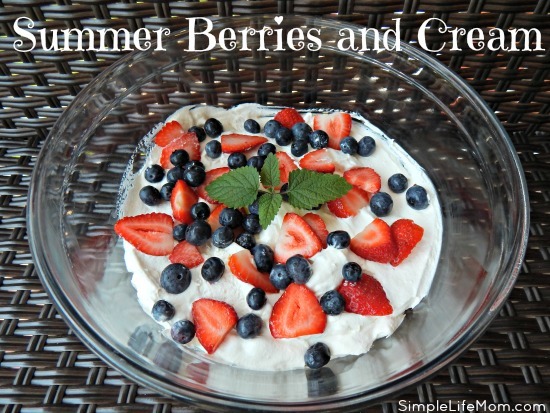 One of my summer favorites, Berries and Cream simple and delicious! Hope you have had a great weekend and thanks so much for sharing with Full Plate Thursday! Thank you for sharing this wonderful article on Green Thumb Thursday. 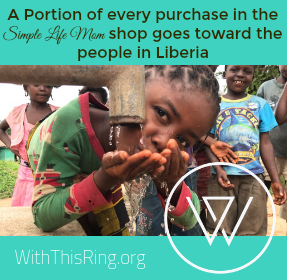 While I’m slobbering all over myself, I’m also featuring this post on my site for the hop this week. 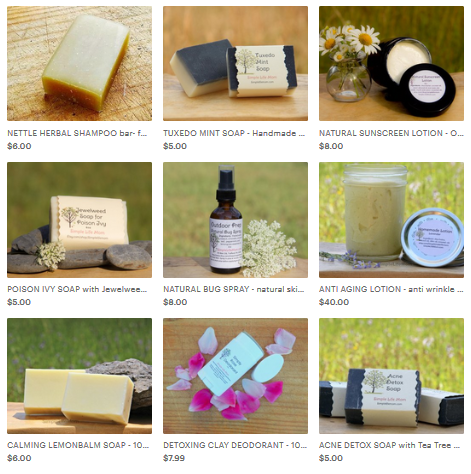 Feel free to grab the featured button when you link up this week! This sounds so good and it looks beautiful too. As my grandmother use to say, “Presentation is everything”. Since my stuff never turns out pretty, I like to say, “Well you can’t eat it whole anyways”. Thanks for sharing on Green Thumb Thursday! Oh, your photos make me hungry…and a little envious….A doe got through the deer fencing around our garden the other night and stripped my blueberry bushes. So sad. Enjoy your berries! I love this simple delicious dish. Thanks so much for sharing this awesome recipe with us at Full Plate Thursday! Thanks so much for sharing with us at Full Plate Thursday and hope you are having a great holiday season! How beautiful! Definitely a great idea for the Fourth of July. I really like it. It is so light and simple to make! Oh my goodness. What a delightful treat! I know it would be amazing. Yum! So wonderful to have fresh berries from your garden! Strawberries and Cream is a great way to use them up. Looks like it comes together quickly too! Summer in a bowl! Wow! That’s what I’m talking about – kinda like cheesecake, but lighter. Yummmmmmy! Such a delicious treat for the holidays! Pinning! Such a delicious dessert! Perfect for the 4th of July!